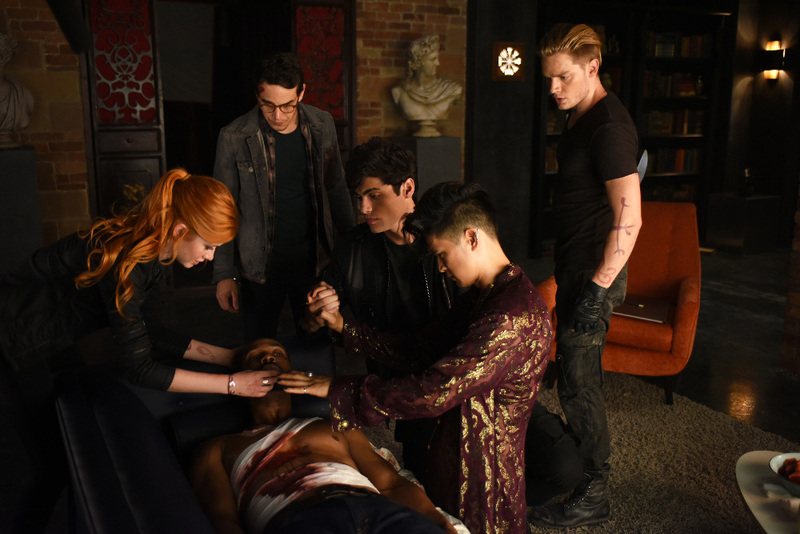 ABC Family/Freeform has released a ton of promotional photos for the sixth episode of Shadowhunters titled “Of Men and Angels,” which airs Feb. 16. In “Of Men and Angels,” Clary learns the truth about her mother’s past and how Valentine came to be evil. Check out the photos below, which feature some behind the scenes shots. SHADOWHUNTERS – “Of Men and Angels” – Magnus and Luke reveal Clary’s past in “Of Men and Angels,” an all-new episode of “Shadowhunters,” airing Tuesday, February 16th at 9:00 – 10:00 p.m., EST/PST on Freeform, the new name for ABC Family. (Freeform/John Medland) KATHERINE MCNAMARA, HARRY SHUM JR.
SHADOWHUNTERS – “Of Men and Angels” – Magnus and Luke reveal Clary’s past in “Of Men and Angels,” an all-new episode of “Shadowhunters,” airing Tuesday, February 16th at 9:00 – 10:00 p.m., EST/PST on Freeform, the new name for ABC Family. (Freeform/John Medland) MATTHEW DADDARIO, HARRY SHUM JR.
SHADOWHUNTERS – “Of Men and Angels” – Magnus and Luke reveal Clary’s past in “Of Men and Angels,” an all-new episode of “Shadowhunters,” airing Tuesday, February 16th at 9:00 – 10:00 p.m., EST/PST on Freeform, the new name for ABC Family. (Freeform/John Medland) HARRY SHUM JR.
SHADOWHUNTERS – “Of Men and Angels” – Magnus and Luke reveal Clary’s past in “Of Men and Angels,” an all-new episode of “Shadowhunters,” airing Tuesday, February 16th at 9:00 – 10:00 p.m., EST/PST on Freeform, the new name for ABC Family. (Freeform/John Medland) ISAIAH MUSTAFA, OZ SCOTT (DIRECTOR), MATTHEW DADDARIO, HARRY SHUM JR.
SHADOWHUNTERS – “Of Men and Angels” – Magnus and Luke reveal Clary’s past in “Of Men and Angels,” an all-new episode of “Shadowhunters,” airing Tuesday, February 16th at 9:00 – 10:00 p.m., EST/PST on Freeform, the new name for ABC Family. (Freeform/John Medland) ISAIAH MUSTAFA, MATTHEW DADDARIO, HARRY SHUM JR.
Shadowhunters premieres tonight at 9/8c on Freeform. The amount of Malec pictures makes me want to cry glittery tears of joy!!!!!!! What the hell? Rushing the plot much, aren’t we? Lame….I cannot think of anything else to say because this just makes me sick. Literally, this show makes me sick each week from the unforgivable inaccuracies. This episode’s gonna be great! Wonderful!!! Luke,Jocelyn and Valentine look amazing!!!!!! Matthew is so incredibly beautiful. Um? Who stabbed Luke? In the original story line that doesn’t happen until Sebastian shows up and kidnaps Jace with the aid of his surrogate demon mother, Lilith. The pictures are AMAZING!!!!!! !CAN’T WAIT!!!!!!!!!!!!!!!!!!!!!!!!!!!!!!!!!!!!!!!!!!!!!!!!!! !